---M&Ms-pick out all the yellow ones and eat the rest. See, I told you the kiddos love this project! Line a cookie sheet with wax paper. Blob a bit of melted chocolate on the wax paper about the size of a quarter. Put a yellow m&m in the center of chocolate blob with the logo down/not showing. 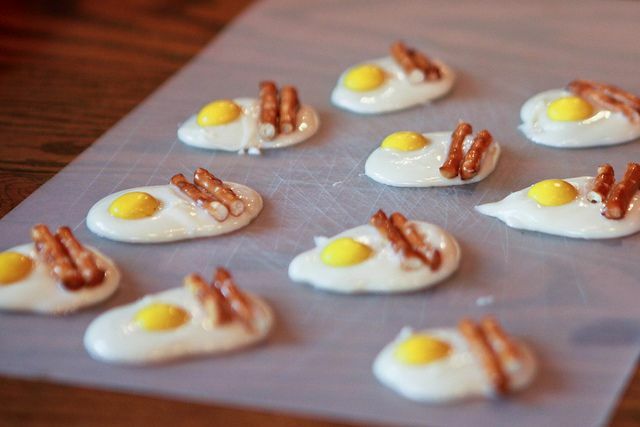 Break the pretzel stick in half and put your 2 "bacon strips" along side egg. Repeat till you've used up your ingredients or you have to do laundry. Transfer to refrigerator to chill till chocolate sets about 20-30 min.